I have never made 'Challah' before. Reason being the use of egg in it. I could've made it without eggs, but never felt the reason to until today. This is what happened last week. We live in a very good neighborhood. People are decent, it is a great place to raise kids. Last friday night or rather saturday early morning a bunch of teenage kids (probably drunk) thought it was fun to throw eggs at all the doors in our neighborhood. Luckily there was only one egg on my door step whereas some of the neighbors' cars were covered with eggs. Their mischief didn't stop with that. They had to take a baseball bat and smash some of the mail boxes. It was done in random. Anyway, long story short we decided to replace the mail box. But, before I could go out to the store and buy a new one, my opposite house neighbor voluntarily came and fixed the smashed mail box. We hardly see him even though his kids and his wife are around all the time. That was very nice of him and I wanted to thank them by making them something. 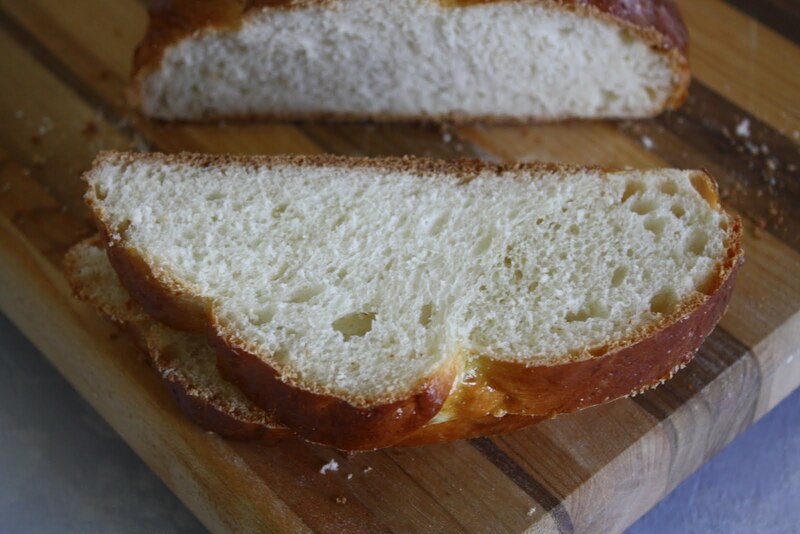 His wife had mentioned how the kids love french toast made with Challah bread one day and that is the reason I decide to make this bread. I made two loaves. One to give away and one for my house even though I won't get to eat it. Recipe is adapted from my bread machine manual. Water - Mixed with eggs to make 1 1/2 cups -- See instructions below. I used the bread machine on dough cycle to make the dough, but I am giving you by hand method here. In a bowl, beat the eggs with 1 TBSP of water. Take out 3 TBSP of this mixture for the glaze. Top the rest with luke warm water to make it 1 1/2 cups. To this, add sugar, dry yeast. Let it sit for about 5 minutes or till frothy. Add to this salt, oil and flour little by little to make a smooth dough. Knead it well for at least 10 minutes. Cover and let rise till double in bulk or for about an hour. Divide the whole dough into 2 parts. Divide each half into 3 portions. On a lightly floured surface, roll each portion into a 10 " long roll. You'll have 6 10" long rolls. Place 3 rolls side by side on a parchment paper and pinch one side together. Using a lightly floured hands braid them and pinch them together at the end. Repeat with the rest 3 rolls. My first braid didn't come out all that great, but the second one was much better. Place the loaves with parchment paper on cookie sheet. Brush with egg wash and cover loosely with aluminum foil. I made a mistake and covered them with plastic wrap and it stuck at the end and the smoothness of the loaves was kind of lost. Let it rise for 45 minutes to an hour. Towards the end of rising time, preheat the oven to 400 F. Brush the loaves again with egg wash and bake for 10 minutes. Reduce the oven temperature to 350 F and bake for another 20 - 25 minutes or till nicely browned and the bottom sounds hollow when tapped. Mine was done at 20 minutes at 350 F. Cool on wire rack and slice when completely cool. I gave away the nicer looking loaf to my neighbor saying 'Thanks' and kept the other one for our house. I didn't eat it so I can't say how good it was but my kids loved it. I guess it is a good bread. 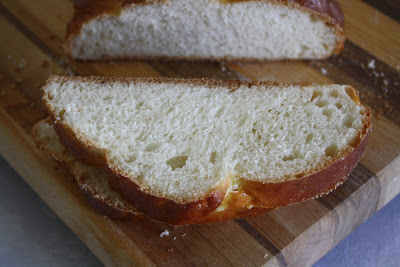 But the crumb was awesome as you can see and for those who are hesitant to try this because of braiding, there is no reason why you can't bake this in a loaf pan. I have seen Ina Garten saying these make the best croutons for soups and the one she sliced was baked in a loaf pan. And I have heard people saying that these make the best french toast. Another peek at the loaf isn't this gorgeous? I am sending these loaves to Susan's 'Yeastspotting'. This bread looks very beautiful. Recently I saw in my friends blog too. Thats a nw kinda of bread to me!! Looks tempting! Nice to know that you have such a nice and helpful neighbour . Bread looks gorgeous. Lucky neigbors. Beautiful and worth trying bread..looks great.. It is looking gorgeous...and the crust looks too gud..
For the egg in the dough, either use yogurt or sour cream. It should work just fine. If you are alright using ricotta cheese, use part skim ricotta cheese in its place to get a nice crumb. For brushing, just mix 2 TBSP of milk with 2 TBSP of oil and brush them before baking. It probably will not give you this gorgeous color, but will be just fine. I do that for most of my bread since I don't consume eggs. 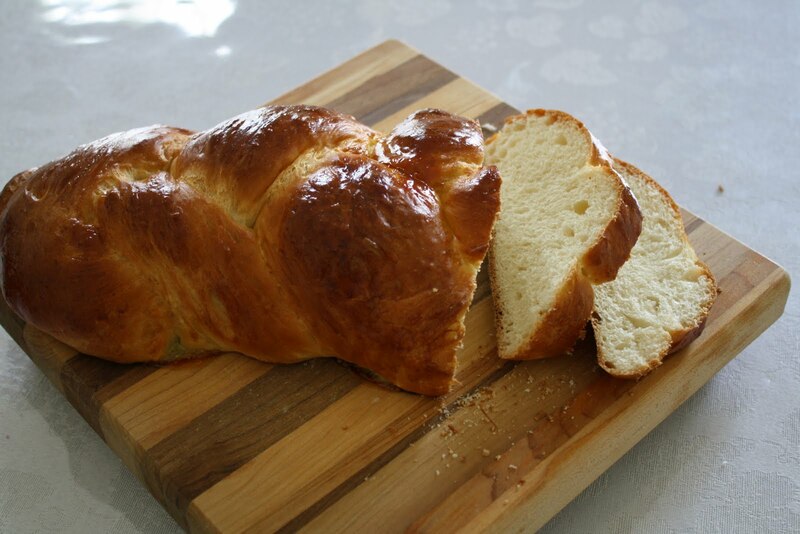 Thanks for taking time to leave a comment and I look forward to seeing your bread pictures. HI Champs, I did made the bread other day & it came out good but I used eggs....it did not rise that much but over all it was good bread. Thanks. Looks fabulous Champa! 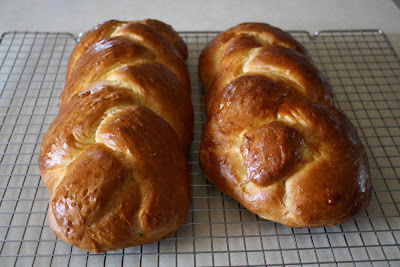 Once the bread is braided, it needs to double again? Am not sure if I can gauge if it has doubled.. Yes. It needs to be doubled. After braiding, leave it covered for 30 minutes or so. When you gently press the dough, the indentation stays, the dough is ready to be baked. Hope this helps.